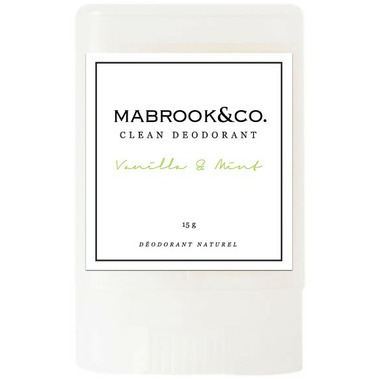 View all products by Mabrook & Co.
Mabrooke & Co. Clean Deodorant fights odour and sweat by combining pure, natural, and organic ingredients in the most powerful and safe formula possible. Clean Deodorant will have you feeling confident and fresh and contains NO parabens, phthalates, propylene glycol, petrochemicals, or toxins. All this freshness in a convenient travel size! Directions: Apply product to clean underarms. Allow product to absorb for maximal efficacy. The scent in this product is almost non existence. It also crumbles when applying it, I will not purchase again. Love it !!! Been looking for a natural deodorant for quite a while now and finaly found this one . After trying so many but nothing worked,so happy to say that this one is amazing. I've not tried it yet as I bought it for vacation coming late Spring but this tiny mouse-sized product won't last the 3 weeks of vacation I am sure! Yes, I know it is travel-size but this is more tester size and frankly for the price each application had better work for 48hrs. Being Canadian, one can visualize that this is not much bigger than a flippin' loonie - in height or width. Not worth the price imo. Smells like a sweet mint-y gum. I haven't tested it on a hot day so i don't know if it will be effective then. The travel size is perfect for keeping at work/in your bag. I was actually surprised how much I liked this. My very sensitive skin didn't react, it worked (need to reapply on really hot days), I love the smell, and the package is so simple and pretty. I ordered the full size right away after falling in love with the travel size. a year ago I switched to natural deodorant and this has been by far the best product I have fount to date. It tingles a bit when you put it on. Feels very fresh. Lasts all day, and into the evening. The packaging could use some work as it's softer than the normal deodorant stick product. I just wipe the excess off the sides when I use it. Great product! This scent claims it is vanilla mint; however, I only smelled a strong scent of mint. The scent maybe lasted around 2 hours but the consistency of the product didn't work with my sweat and irritated my armpits pretty bad.